Surrounding a large colored gemstone with a row of diamonds is a classic showcase design, and it's used twice in this brooch: a large faceted oval ruby in a diamond surround above a pear-shaped ruby and diamond pendant. These rubies are exceptionally large examples of the stone; big rubies are rare, and recent auctions have seen them sell for millions. It is not surprising, then, that these stones have a long history in the royal family. In July 1854, Queen Victoria purchased from Garrard a set of opal and diamond jewelry consisting of a necklace, a pair of earrings, and a brooch. These items were probably bought to create a set with her Oriental Circlet tiara, which was designed in opals and diamonds by her husband, Prince Albert, and had been completed by Garrard the previous year. 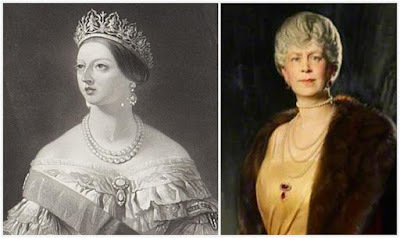 The brooch shown here is most likely that 1854 brooch; the Oriental Circlet and Queen Victoria's Crown Ruby Earrings and Necklace have been covered previously. Queen Victoria and Queen Mary, wearing what may be this brooch. 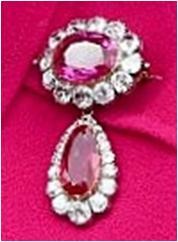 Queen Victoria would have been wearing the opal version, though she was also painted in a ruby brooch of a similar design. These pieces were left by Queen Victoria to the Crown when she died in 1901, and they have remained in the collection ever since, though they no longer look as they did when Queen Victoria wore them. Most of the opals were removed and replaced by rubies in 1901/2 by Queen Alexandra; according to Suzy Menkes' The Royal Jewels, the brooch was not altered to ruby stones until 1926. 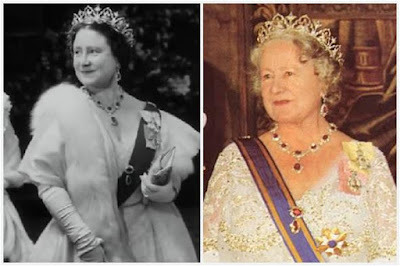 Despite the alternations, the parure was truly showcased until it passed to Queen Elizabeth (the future Queen Mother) after her husband, George VI, took the throne. The Oriental Circlet and Crown Ruby Necklace and Earrings were among her favorite jewels. She liked the ruby parure so much, she kept it after her daughter took the throne in 1952, and wore it throughout her widowhood. She also used other ruby brooches with the parure; in fact, when listing the set as used by Queen Elizabeth The Queen Mother, The Queen's Jewels by Leslie Field states that it includes four brooches. The Crown ruby set returned to The Queen after her mother's death in 2002. The pendant brooch was the last of the three main parts of the set (tiara, necklace/earrings, brooch) to get its public debut, making a big splash at the first day of Royal Ascot in 2015. Unlike her mother, The Queen has chosen to wear all the pieces separately, and has yet to combine them. As large, impressive, and priceless as Queen Victoria's Crown Ruby Brooch is on its own, I'm still looking forward to the day when we see it reunited with the Oriental Circlet and the Crown Ruby Earrings and Necklace.